Today we are catching up with the folks over at CloudBerry Labs, makers of the CloudBerry Online Backup solution we reviewed two years ago. There have been some significant changes since then, and part of those changes are related to how data can be stored on Amazon. Late last year, Amazon launched a new storage option called Amazon Glacier. It’s designed as a very cheap alternative for those of us that will rarely, if ever, need to actually access our data. For example, my most important data – the one thing I would absolutely hate to lose – are my photos. 10+ years of my daughter growing up. I’ve got the photos on my laptop. But if that crashed, was lost, or stolen – I’d be in a world of hurt. I’ve been backing these photos up on Amazon S3 using CloudBerry Online Backup. CloudBerry is a set and forget type program. The program has been automatically backing up my photo (and mail) directories to Amazon S3 for several years now. Over time, the monthly cost from Amazon has slowly crept up, from $2 per month to about $17 per month now. That’s a bit more than I want to be paying, so I contacted CloudBerry Labs for an alternative. Turns out, they now have a push button way to lower storage costs. 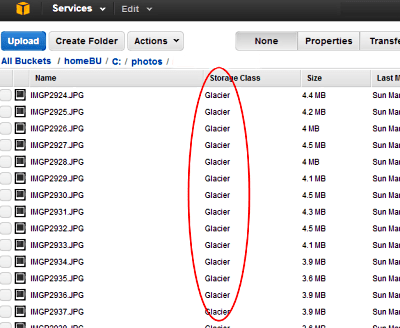 On the CloudBerry Backup interface, under ‘tools,’ there is now an ‘archive to Glacier settings’ option. Once a path is selected and the ‘ok’ button pushed, the program sets the backup to be saved on Amazon’s Glacier storage service. On Amazon S3, the cost to store 100 GB of data is $9.50 per month. On Amazon Glacier, 100 GB of storage costs $1 per month. Yep, just a penny per GB per month. Of course, Amazon storage pricing is never quite that simple. There are caveats, which are detailed by Amazon here. 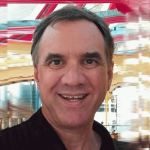 But to boil it down – the main cost occurs when a user fetches the data from Glacier. Continuing my example… if my harddrive crashed and I needed to recover 100GB of data (my photos) from Amazon Glacier, Amazon will charge $23.83 for the download — IF — the data is downloaded over a 60 hour time period (that’s where the ‘Glacier’ part comes in). Data can be downloaded faster, but the cost goes up – a lot. If that same 100 GB is downloaded over 4 hours -it would cost almost $200. CloudBerry Backup does have a way to set the download speed when recovering a backup from Amazon Glacier – and it includes a cost estimator. Now, just to complicate things a bit more, Amazon also has a 5¢ charge per thousand requests. We asked CloudBerry Labs marketing director Alexander Negrash about the requests charge, and also about this post by Justin Moss on Opinion Road, which warns of the exorbitant costs of – uploading – data to Glacier through CloudBerry. As for the post on Opinion Road? I was able to confirm this fact about 24 hours after I had set CloudBerry to archive my backups to Glacier (see image to right). Now we’ll turn this over to you. Have you used, or are you considering using, CloudBerry Online Backup to backup and save your files to Amazon’s Glacier Storage service? Share your experiences and comments below! For members only: 30% off the purchase of CloudBerry Backup Desktop Edition NR (and discounts on a number of other CloudBerry products, including the server edition). You can pick up the coupon/promo code in the members-only section of our forum. The coupon is good until July 17, 2013. CP membership is free and new members are welcome – join now! * Our bias-free promise: CP does not recommend, promote, or cover products or services in our articles in exchange for revenue. No income is earned by this site or author through use of this coupon.